I’ve just got this photo from Øystein Lia, the project leader for the Electromagnetic Fountain at NLI Engineering. 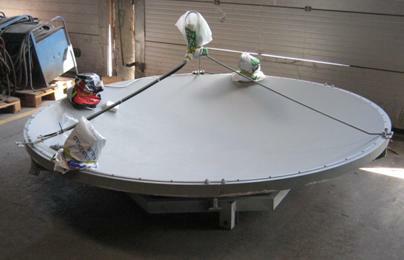 A retired parabol antenna dish stemming from Tryvann, Oslo, that will form the fountain bowl. It looks quite small, but is in fact 2.5m in diameter. THIS page describes how to identify the sources of electromagnetic radiation as heard using the Electrosmog detector that I used in my field survey for the Electromagnetic Fountain, and gives sound sample examples of them (listed below). Here’s a video of the Zap Checker detector in action where the Electromagnetic Fountain is planned to stand. Frequency range: covers 1 MHz to 8 GHz. Output: Audio Jack and needle display. Calibration: Can be calibrated for different signal ranges and for digital and analog signals. Sniffing in Stavanger – Electrosmog Detector in the Rain! Here’s a video of the Electrosmog Detector in action in the rain. Its much more noisy. Here’s a video of the Electrosmog Detector in action during location scouting for the Electromagnetic Fountain in Stavanger. Conditions: very humid, sunny period between heavy rain.